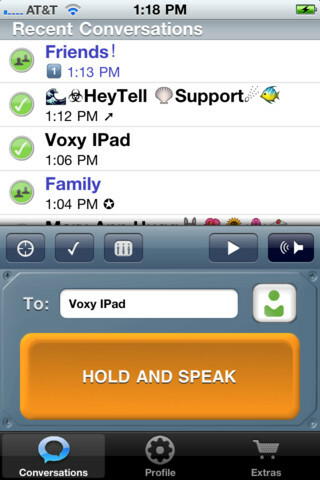 HeyTell is a fun app that turns your iPhone into a walkie talkie, essentially bringing Push-to-Talk to your device. It has just been updated to support iOS 5 and Bluetooth. * New languages: Chinese (Simplified), Danish, Russian, Swedish. Many, many thanks go out to both Jonas Bohdén for providing the Swedish translation and to Dennis Eriksen for providing the Danish translation! * Fixed stutter and beep where, in iOS 5.0, if you’re using ringtones and the app is open, you’d have to wait for the vibration for the notification tone to buzz when a message arrives. Buzz and ring should now occur simultaneously. * In iOS 5, native Twitter client is used for message export (expand the conversation, select the message, tap the Actions button, then tap Share Online). * Resolved issue where, when running some podcasting apps, HeyTell messages don’t play fully. Audio now ducks the way it does for the music player. To play music while HeyTell is running, plug headphones or speakers into the device and then, inside HeyTell, toggle the speaker button to earpiece mode, then open your music player/podcasting app. You should now be able to open HeyTell and the music player will continue. HeyTell requires your friends to also have the app. Coupled with Siri and now support for Bluetooth, the app can make the ultimate solution for communicating handsfree. Click here to download HeyTell–it’s free.